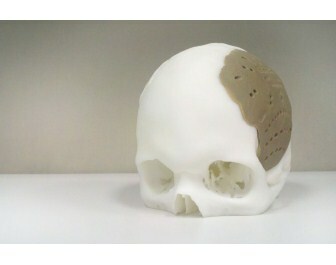 Oxford Performance Materials (OPM) announced that it has received FDA 510(k) clearance for the OsteoFab Patient Specific Cranial Device (OPSCD), a brand for Additively Manufactured medical and implant parts with 3D printing produced from polyetherketoneketone (PEKK) polymer. FDA clearance of this device marks the first US Food and Drug Administration (FDA) approval for an additively manufactured polymer implant, says OPM. A first skull implant operation was done on March 4. With its Additive Manufacturing process, which is a 3D Printing technology, implants are “grown” layer by layer directly from a digital CAD file without the aid of tooling and with few practical limits on what can be produced. It is ideal for one‐off implants specifically shaped to each patient’s anatomy. According to OPM, one very desirable use of patient specific implants and the indication for the OPSCD is cranial implants to replace bony voids in the skull due to trauma or disease. The OPSCD is manufactured from PEKK, an ultrahigh performance polymer that is biocompatible, mechanically similar to bone, and radiolucent so as not to interfere with X‐Ray equipment. OPM says it has recently completed testing which confirms that the OsteoFab implant surface is, in fact, osteoconductive.